Sheffield Steeldogs had a mixed weekend, winning and losing by a two goal margin. They beat Guildford Flames 5-3 at home before losing by the same score at Hull Pirates. 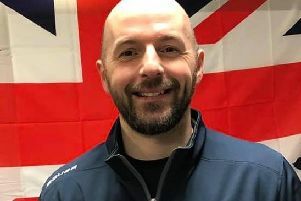 After three games short-benched, Steeldogs ranks were strengthened by two short-term signings, former favourite Lloyd Gibson and Czech forward Jan Křivohlávek. Saturday didn't start well with Guildford taking an early lead. Steeldogs were flat throughout the period and we're lucky to only be a goal behind at the break. The middle period was very different; Cole Shudra got things going with a power play goal and this brought the team to life. Pavel Mrna showed soft hands to beat Ullberg as his line with Bosas and Wood really clicked. Debutant Křivohlávek scored on another man advantage and when Mrna skipped through the Flames backline to make it 4-1, the game had been flipped on its head. Eriksson scored bang on 40 minutes to give Guildford hope for the final period. Krajl made it a one goal game with just over six minutes to play and with the clock running down they pulled Ullberg. At the third opportunity, Sheffield found the empty net, Mrna turning provider for Bosas. Returnee Lloyd Gibson said after the game: “It was good to be back, I know a lot of the lads. The Steeldogs are always the first result I look for. Hopefully I helped out a little bit! “Woody told the guys after the first period that we needed to pick it up, we were all a bit flat they came out hard but they were a bit short benched so we knew if we worked them hard down low then Jimmy (James Hadfield) would have less to do and we’d see the benefits – and we really did”. Sunday night in Hull was high paced from the start. The home side thought they had an early goal but the puck hit the post and came out but they did go ahead when Lascek beat Hadfield up high on a power play. The turning point of the night came when Tom Relf was boarded; Referee Mr Miller neither called anything nor stopped play, so Mrna dislodged the goal so his team mate could receive medical attention. He was penalised for this and his reaction saw him given a Match penalty. By the end of the penalties, Hull were 3-0 up. A comeback looked even less like when Jan Křivohlávek was taken out, leaving the ice in obvious pain, never to return. Then Andy Hirst got a goal on a power play and Greg Wood made it two - and suddenly the game was alive. Ex-Steeldog Lee Haywood made it 4-2 before Wood set up an exciting finish with his second. Despite another power play opportunity, Sheffield couldn't find the tying goal and when Hull got an empty net goal, tempers boiled over. Callum Pattison engaged with a Pirate and when Ryan Watt went for Cole Shudra, Ben Morgan stepped in and traded blows. A bad tempered end to a game spoiled by the officiating. Next up for the Steeldogs, a double header against the reigning league champions, the Basingstoke Bison. Saturday they are on the road before a game at iceSheffield on Sunday (5.30 face-off).